I arrived home at about 6:30 last night from a business trip and decided to go for run. I generally prefer to run in the morning but the forecast accurately said there would be rain this morning. As is often the case, I get pensive on my runs. This time my thoughts were on intelligence, educational and morality. 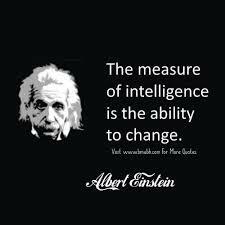 Intelligence may be best described as the ability to change your mind. Morality is the ability to empathize with others. By the way, if you think morality is exclusive to humans you have never seen a nature show of elephants taking care of each other or owned a dog. I'll hazard to guess that morality is correlated to an extent with education. But only to an extent. If you are widely read, you experience many points of view and learn to empathize with them. On the other hand, it may be that you are widely read because you empathize with others. At any rate, there are many people who lack a good education but are quite moral. Education alone does not make you moral. But it can help. A few years ago I got on the probiotic bus. I eat yogurt, natural sauerkraut and drink kefir and kombucha. Until recently I made my own water kefir. Although I still take in a lot of probiotics because I like the taste, the evidence shows that it does little if any good. Clearly probiotics are not a panacea for good health. Now I am not genius but I do try consciously not to be inflexible in my thinking. New knowledge and facts should always be taken into account. Sadly, I think it is quite common for people to be rigid in their beliefs. Worse, many people actually become more rigid in their beliefs when presented with evidence that contradicts their beliefs. Just look at our current political polarization. I have struggled to understand how the clear and really unquestionable evidence of fraud and other crimes have been so ignored in Spring's divorce of me. Not just by the court by the Lawyers Professional Responsibility Board and the county attorney among others. But I should not have been surprised.When you show evidence of crime and immorality in an organization, people associated with that organization often feel attacked and react by ignoring reality and going on the attack themselves. Just like individuals have a rigidity of thought so do organizations, which after all, are made up of individuals. Few have the moral fiber to take the facts into account and react in a just manner. We see this over and over. Nixon's crime was not that he broke into the Watergate hotel, it was that he conspired to cover it up. So what can I do? Possibly the only thing I can do is escalate the exposure to the point where they fear the consequences enough to change their stance. Nixon ultimately resigned as he judged it better than impeachment. It may be that the court will end alimony rather than allow me to starve to death and the exposure it would necessarily bring to the corrupt practices so widely tolerated, and indeed rewarded, within the legal system. Maybe.